This Jacaranda tree was in the way of a development project. It is a beautiful tree, a shame to remove, but that’s our job. 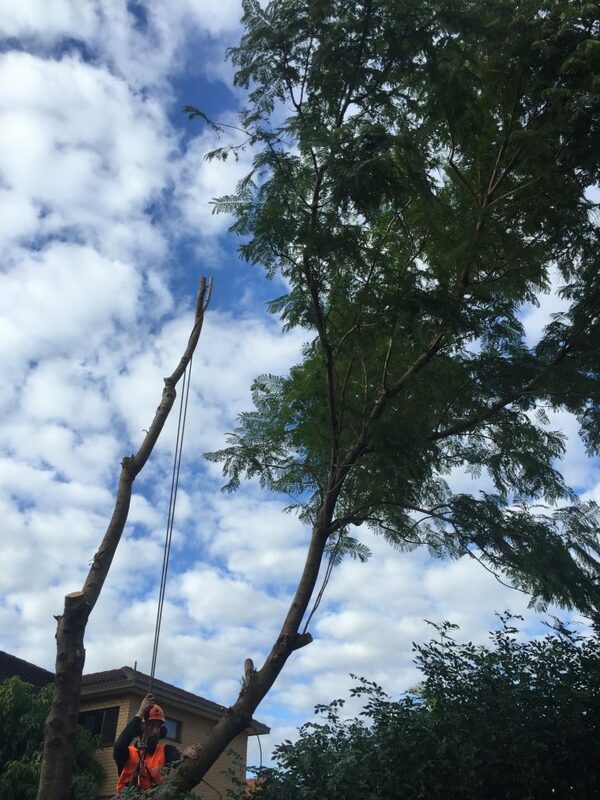 If you want any tree removed, and you have council approval, then we’ll do it! After using Sydney Tree Company a second time I can confident say it was once again a stress-free experience. Their communication skills were just as great as their arbor abilities. They gave us professional advice, did the tree work in a timely manner and for the right price. Cheers guys! Thanks to the team at Sydney Tree Company for a great job removing and pruning our trees. They were not only the best value but they did an exceptional job! My neighbour even commented what a great job they did and how they left the state of our properties. I would recommend for tree pruning and removal and will definitely use again in the future. Fantastic! Cut down my trees without damaging clothesline or fence. The job required work around power lines and they completed it with such care and precision. Afterwards my yard was cleaner than it was before they came. My neighbour was so impressed that he arranged for a tree to be removed soon. Great price and I highly recommended to anyone. We’ve just used Sydney Tree Company to remove a dangerous looking Redwood. They arrived at the scheduled time, took great care to remove the tree without damaging our property. It was a difficult task as the tree were surrounded by electrical and plumbing services. I have no hesitation in recommending them to anyone who needs tree pruning or removal carried out. We service all of Sydney and the surrounding regions. Call Us 0431 732 265 to get quote or submit the form.